see events for AGM notice and all details. 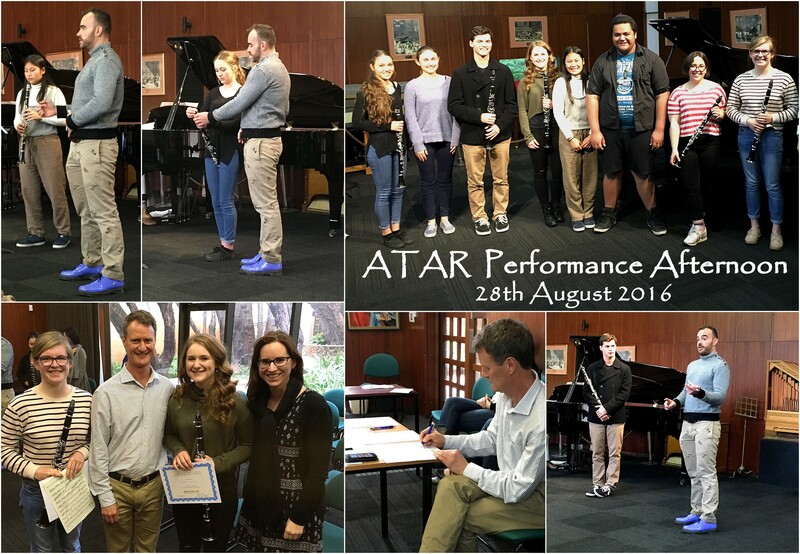 The Clarinet and Saxophone Society of Western Australia held its annual ATAR Performance Afternoon for year 11 and 12 students on Sunday 28 August at The University of Western Australia’s Eileen Joyce Studio. Ten students from five government high schools each performed one repertoire item to a supportive audience of family and friends. CASSWA provided Irene Shaw as the accompanist and a range of pieces were performed. These included: Lutoslawski- Dance Preludes #5, Brahms- Sonata #1, Previn- Fancy Passing, Hindemith- Sonata, Mozart- Adagio, Gaubert- Fantaisie and Bergson- Scene and Air. Ashley Smith, UWA School of Music’s Head of Winds and Contemporary Performance Programs, provided valuable feedback at the conclusion of each student’s performance. CASSWA Chair Person and Principal Clarinet of WASO, Allan Meyer, also gave written feedback for each student. All feedback was much appreciated and well received. All students performed at a very high standard and two awards were presented at the conclusion of the event. Jane Pankhurst from Perth Modern School won the CASSWA Jack Harrison Award for Excellence for her performance of Weber’s Concertino and Sienna Karklin from John Curtin College of the Arts won the Adjudicator’s Encouragement Award for her performance of Poulenc’s Sonata- 1st Movement. The CASSWA Performance Afternoon provided a wonderful performance opportunity and learning experience for students and excellent professional development for teachers. On Sunday 19 June 2016 CASSWA held the 8th annual ClariSaxFeast. This event is the premier event in the CASSWA calendar and this year it was a great success with over 100 attendees! Thank you to Mark Walton for the inspiring workshops, the wonderful performances by the WA Clarinet Quartet and Perth Saxophone Collective and a massive thank you to the CASSWA Committee for organising this fantastic event. Also a big thank you to all the participants for helping make this such a successful day! Thanks so much for getting Mark Walton over this year!!! The morning tea was super yummy!!! I loved it and would love to come next year! 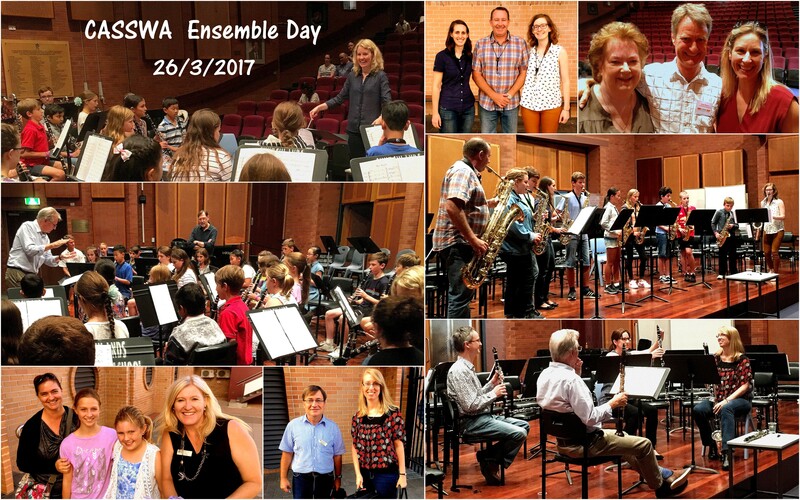 The Clarinet and Saxophone Society of WA (CASSWA) held its annual Clarinet Ensemble Day on Sunday 3rd May at Churchlands SHS. Forty-five students in their second and third year of playing participated in a wonderful afternoon of music making under the direction of Jacqui Edwick and Wayne G’Froerer. During the ensemble session students worked hard to rehearse new repertoire which included a round, clarinet trios and challenging quartets. After a short afternoon tea break, there was a surprise performance by the West Australian Clarinet Quartet, featuring Wayne G’Froerer, Michael Hodgkins, Lisa Gerritsen and Adrianne Dunlop. Students thoroughly enjoyed the demonstrations of the bass clarinet and Eb clarinet, with many students wanting their own ‘baby clarinet’. The Ensemble Day culminated with the students performing a variety of pieces to a very receptive audience of parents, family and friends. The CASSWA Committee is grateful to Churchlands SHS for use of the Paul Latham auditorium and appreciates the West Australian Clarinet Quartet and the School of Instrumental Music clarinet and saxophone teachers for their ongoing support. 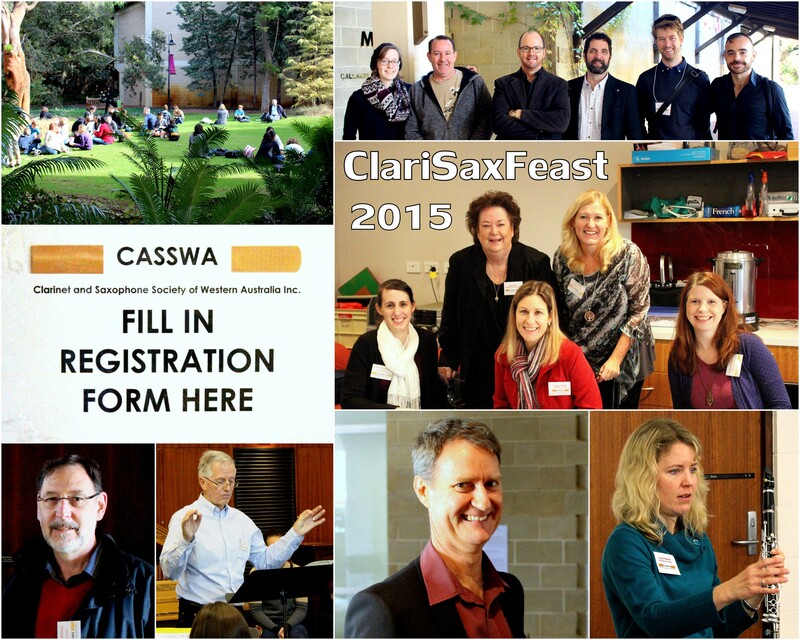 CASSWA’s next event is ClariSaxFeast will be held on Sunday 14th June at UWA. This is CASSWA’s major event of the year andclarinet and saxophone enthusiasts of all ages are welcome to attend. Participants will enjoy a full day of clarinet and saxophone workshops, performances, master-classes and a grand concert. The Clarinet and Saxophone Society of Western Australia held its annual Performance Afternoon for Year 11 and 12 Students at Churchlands Senior High School on Sunday 30th August. Brahms – Sonatas 1 and 2; Weber – Concertino; Mozart – Concerto; Arnold – Sonatina; Finzi – Five Bagatelles; W.L. Webber – Frensham’s Pond; Saint-Saens – Sonata; Banks – Blues for Two and Hurlstone – Four Characteristic Pieces. At the conclusion of each item, Allan Meyer – CASSWA’s Chair Person and highly respected Principal Clarinet of WASO, shared his musical advice with each student and they all received a comprehensive written adjudication. With school and external performance examinations looming, everyone was most appreciative of Allan Meyer’s professional expertise, musical generosity and insightful feedback. All the students performed at a very high standard at the Performance Afternoon and at the conclusion of the recital Jessica Knight from Perth Modern High School was awarded the Jack Harrison Award for Excellence for her performance of the 2nd and 3rd Movements of Weber’s ‘Concertino’ and Adrian Biemmi from Churchlands Senior High School was awarded the CASSWA Adjudicator’s Encouragement Award for his performance of the 1st Movement of the Malcolm Arnold ‘Sonatina’. 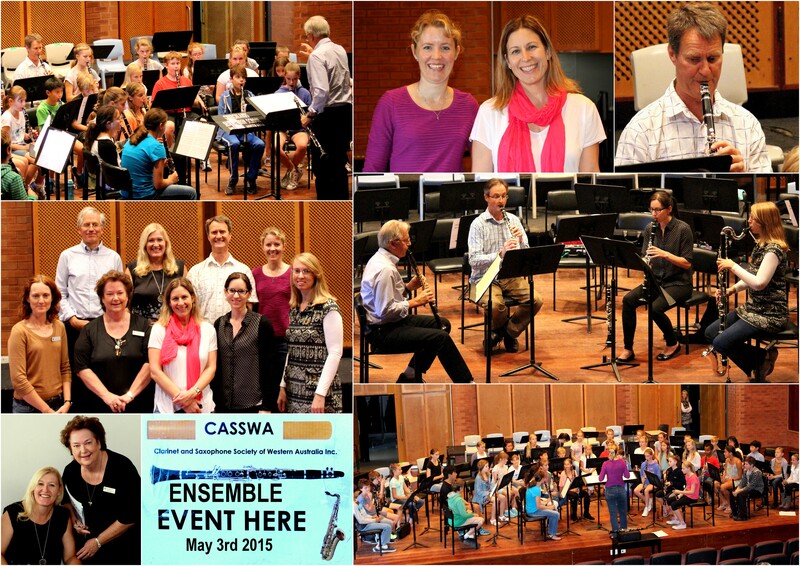 The CASSWA Performance Afternoon continues to provide an ideal learning experience for clarinet and saxophone students and an invaluable professional development opportunity for teachers. On Sunday 14 June 2015 CASSWA held the 7th annual ClariSaxFeast. This event is the premier event in the CASSWA calendar and this year it was a great success with over 90 attendees, our best attendance yet! This year CASSWA introduced on-line registration and to encourage use of this system CASSWA offered 2 prizes. The prize winners, awarded at the end of the event were Toby Cootes (clarinet) and Jacqui Wharton (saxophone). Congratulations Toby and Jacqui! The day started with clarinet and saxophone ensemble sessions. The 2 clarinet ensembles were given expert direction by Wayne G’Froerer and Jacqui Edwick while the saxophones gathered in the auditorium awaiting instructions from saxophone special guest artist. Guest Saxophone artist was Andy Scott from the UK. Andy is a saxophonist, composer and educator and has established an enviable teaching legacy at the Royal Northern College of Music. Thanks to Andy’s presence this year there was a large number of eager saxophonists. They were not disappointed and were treated to some inspirational sessions. Andy has a knack of enabling a room full of saxophone players, from outright beginners through to advanced players, to work together toward creating some memorable musical moments. His disarming approach involved everyone jumping into an ensemble rehearsal for the first session that included a novel warm up routine using mouthpieces only! Using anecdotes about music, and life, he made the rehearsal process very effortless and covered a range of topics including personalising one’s sound, playing dynamically, listening in an ensemble environment and even some improvising. The afternoon session saw him performing and discussing the creative process in his role as a composer and the audience was treated to some very expressive, and impressive, interpretations of his own work. He was very supportive of everyone’s enthusiasm for playing any instrument and following a musical pathway with lots of positive comments and encouragement for all the saxophonists on the day. Guest Clarinet artist was Perth’s own Ashley Smith. Currently Head of Woodwind and Contemporary Performance at the School of Music at UWA Ashley is a Graduate of UWA, a Fellow of ANAM and a Graduate of Yale University. 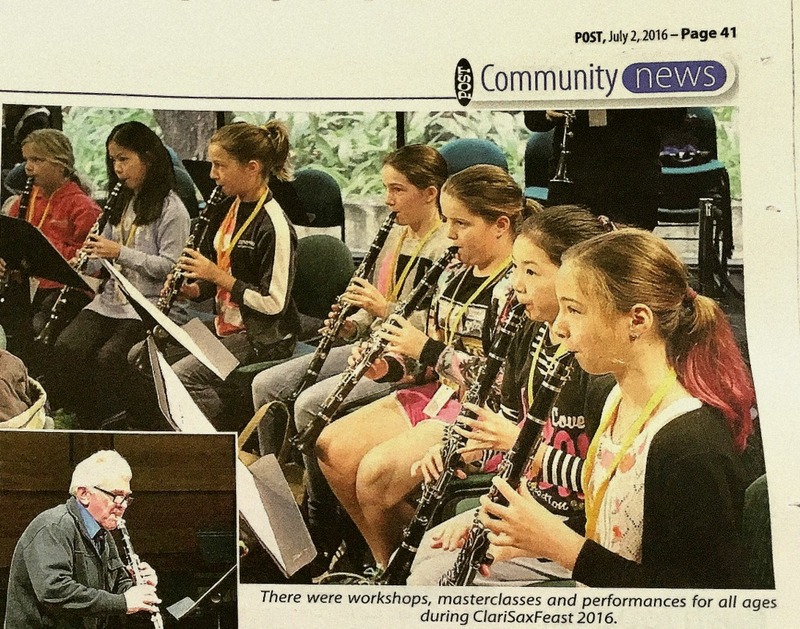 Ashley’s first session involved demonstrating the latest Buffet Crampon range of clarinets. This included the new Divine model. 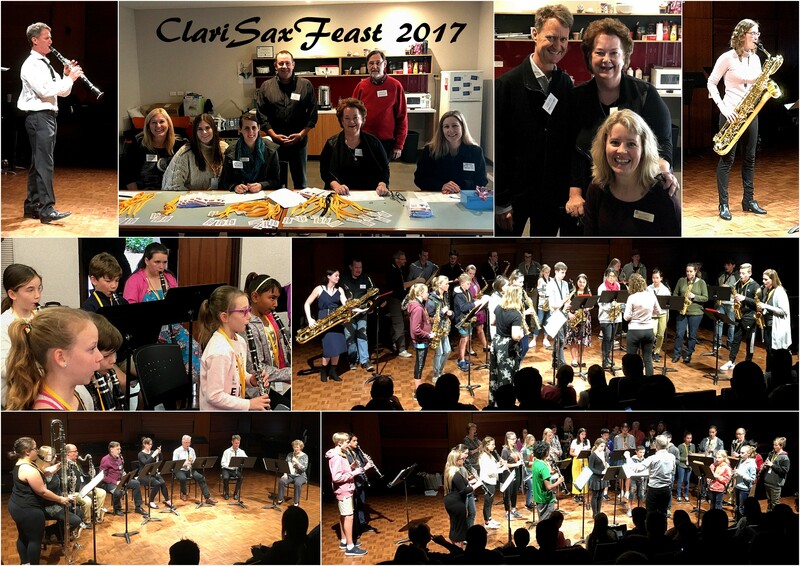 This large range of instruments included Bass Clarinet, Bb and A as well as Eb and was generously provided by Tempest Music who were the featured retailer for ClariSaxFeast. Ashley provided valuable information on the different characteristics of the new Buffet models. Next was a Clarinet Masterclass where three students (yr 11, yr 12 & 2nd yr WAAPA) were given the opportunity to perform their chosen repertoire with Adam Pinto providing valuable assistance on piano. Ashley provided insightful knowledge and helpful criticism in a way that was understood by all levels during the masterclass. Concurrent with the Masterclass was a ‘Back to Basics’ session aimed at the beginner level. Wayne G’Froerer and Tania Swan provided a mix of practical warm up and finger exercises as well as a gadget and ‘care for your instrument and reeds’ information. Next was ‘Working with an Accompanist’. Allan Meyer and Sue King provided valuable guidance on how to approach that first time rehearsal with an accompanist. Four students (1 yr 7 and 3 yr 9) were given the opportunity to stand up in front of an audience. Sue provided the accompaniment and the students were able to hear from Allan ways of getting the most out of that first rehearsal. After a well-earned lunch break attendees were treated to a Grand Concert. 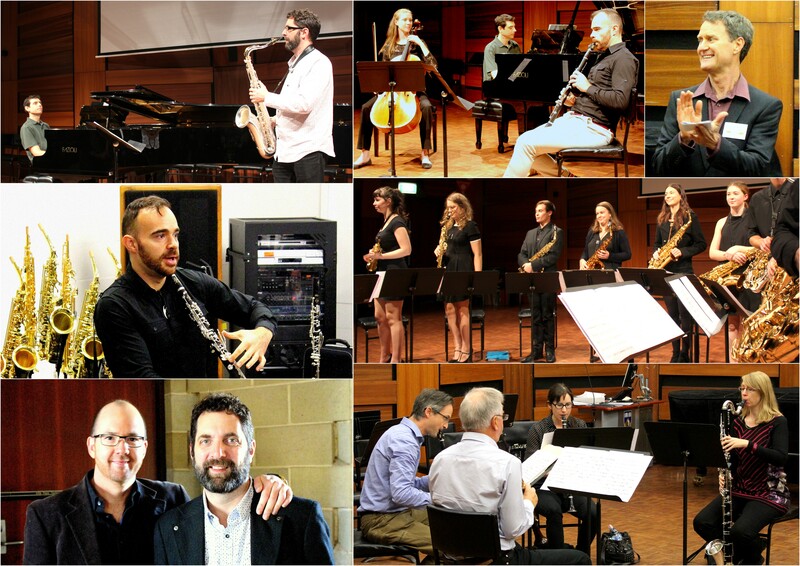 The program not only featured guest artists Andy Scott and Ashley Smith but also the clarinet and saxophone ensembles from the morning session, the WA Clarinet Quartet, the ClariSaxFeast Wind Ensemble and the Perth Saxophone Collective. Adam Pinto (piano) and Louise McKay (cello) were valuable ensemble partners. A BIG thank you to all performers and attendees. 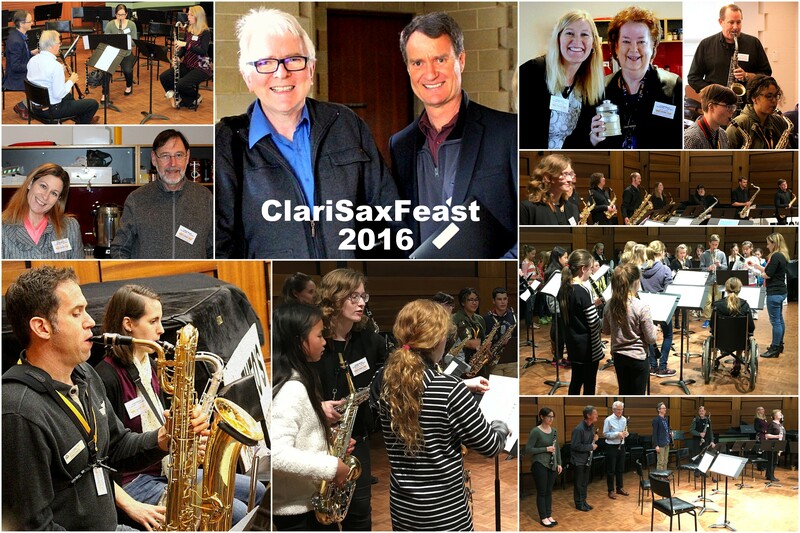 Looking forward to another successful ClariSaxFeast in 2016!